garden5 wrote: Well, I wanted to put out more onions, but I have to till my garden to do that and I got a lot of rain, so now I'm debating on whether or not that's such a good idea . I feel ya on that one! I finally got soil in my new beds with a layer of free "compost" on top. I put that in quotes because they called it compost but was still hot with fresh manure. It was free...I cant complain. I tilled it in today and things were still wet. I REALLY need to get my onions, carrots and potatoes planted! I was able to get the tomatoes planted Wednesday. 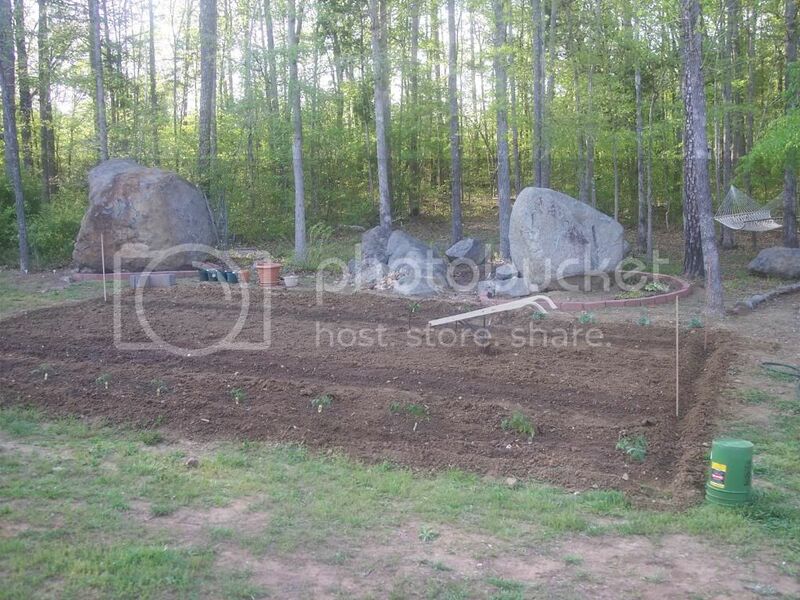 Also planted bush blue lake beans, crookneck squash , zucchini and a couple mammoth Jalapenos. 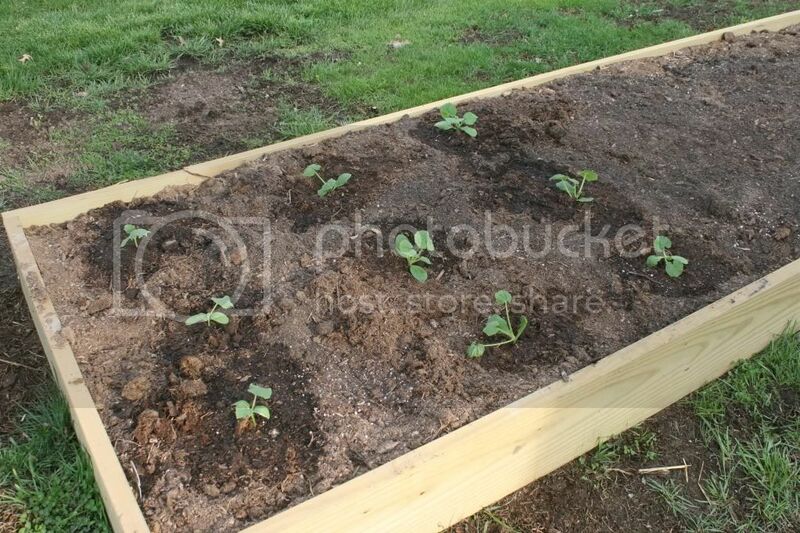 I plan to get the cucumber and okra seed in the ground today along with some more zucchini and a variety of hot pepper plants I am going to purchase at our local Farmer's Exchange. I'll get some pics up soon. Edit: Here is my first attempt at a pic. As you can see, lots more to be done. 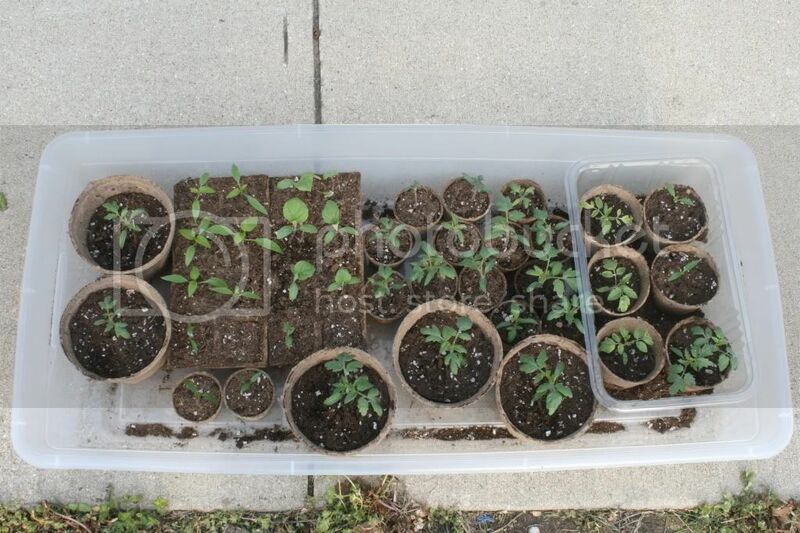 Started onions, leeks, cauliflower, broccoli, broccoflower, oregano, marjoram, cutting celery, red okra, ground cherry, tomatoes, eggplants, hot peppers, etc. from seeds in winter/early spring. Early sown peas, favabeans, spinach, carrots, lettuce, parsnips, beets, Swiss chard, turnips, arugula, mustard greens, Red Russian Kale, etc. are all coming up. Started my annual experimental mini rice paddy with Hmong Sticky rice seeds direct sown and backup seeds sown in a container (already starting to grow). Was out sowing two kinds of corn -- Double Red Sweet and Stowell's Evergreen -- and two kinds of onion seedlings from early Feb sowing -- Red Wethersfield and Sweet Yellow Spanish. one more corn variety -- Buhl -- needs to go in a bed that is still squishy and waiting to dry out on the other side of the house. One more mid Feb?/last sowing of onion seedlings as well as last of the 2 varieties of leek seedlings -- American Flag and French Carantain -- waiting to be planted. Sowed last row of snap peas. Dills Atlantic Giant pumpkin as backup/early starter. All growing unexpectedly well. Planning to start peanuts next. Spring is here but the rain will not stop. Tornados and thunder storms just keep coming. My garden is under water so I am waiting. I wish my garden had a flush level like a toilet. Wow, it looks like many of you guys have your gardens well under way. It looks like Gumbo, much like myself, has his well under water. That Rocky Ford watermelon is an old variety. Seems like I used to buy those from farmers and fill my truck with them and cantaloupes, and tomatoes for resale. That was when I was a kid. Thats how I know it is an old variety. It was a good variety though. I really wanted bonus brownie points for pictures, but it is dark and I am tired. Well I know nobody wants to hear it from up north, but it has been unseasonably warm here - 80-90's most days. I have already harvested the last of my beans (rattlesnake and Fordhook) and have them all packed in the freezer. Even made dilly beans. I also have been picking alot of tomato's, peppers and cucumbers. 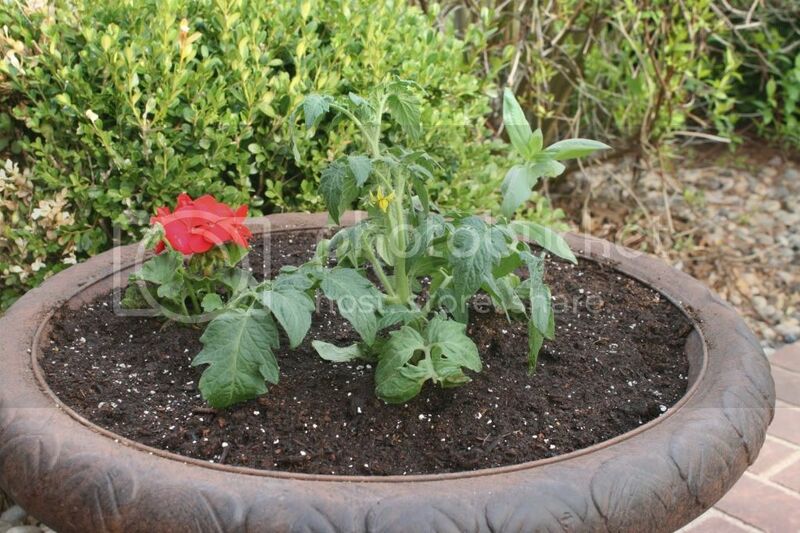 I transplanted some smaller tomatos into larger pots this past weekend. I also foolishly planted corn - I know it will not go anywhere - kinda like a science experimint, my daughter insisted I try again. I did get this cool bean tower and put it together - I love it, and got some more beans in the ground as quick as I could. Harvested all my broccoli, it was literally bolting so quick from the heat, same with my dill and last of the lettuce. I did manage with Jat Ul help to harvest some seed which I have never done and was so thrilled how nice that was. I already have eggplant growing, and lots of hot peppers - again thanks to the forum, I did not realize hot peppers took longer, so I am glad I got the patience bug on that one - I probably wouldhave ripped them out. I am for the most part, happy, butttttt the intense heat really scares me, as well as the lack of sunstantial rain, Afraid I will lose alot to it. 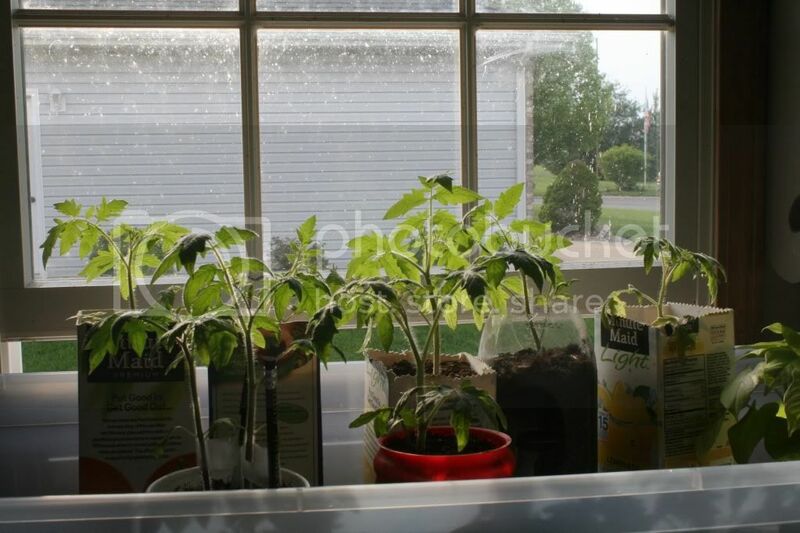 I also have put tulle around all my tomatos and aluminum foil around all the bases of each tomato plant and so far I have had no worms at all. Keeping fingers crossed. I also started my Okra. Been busy! Hoping it warms up for you all, and I hope those horrible storms stop up there. I can't imagine how scary that is. 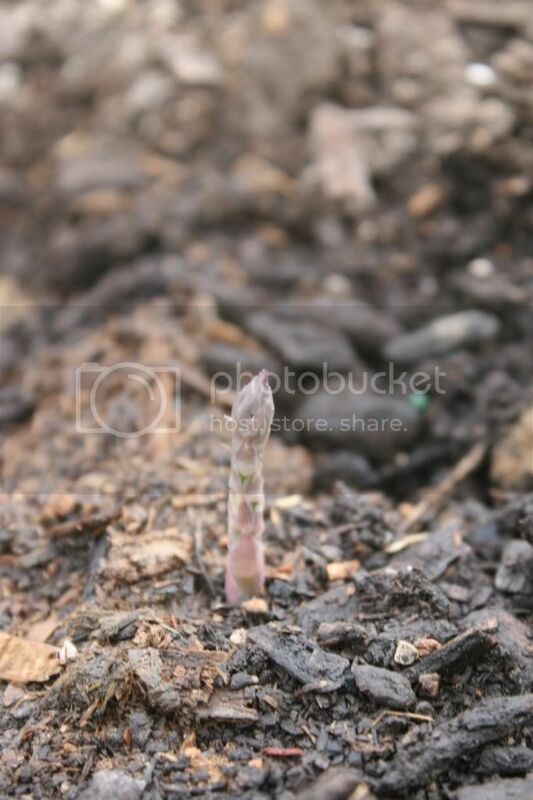 Brian, thanks for showing asparagus coming up ! I have never seen that before. 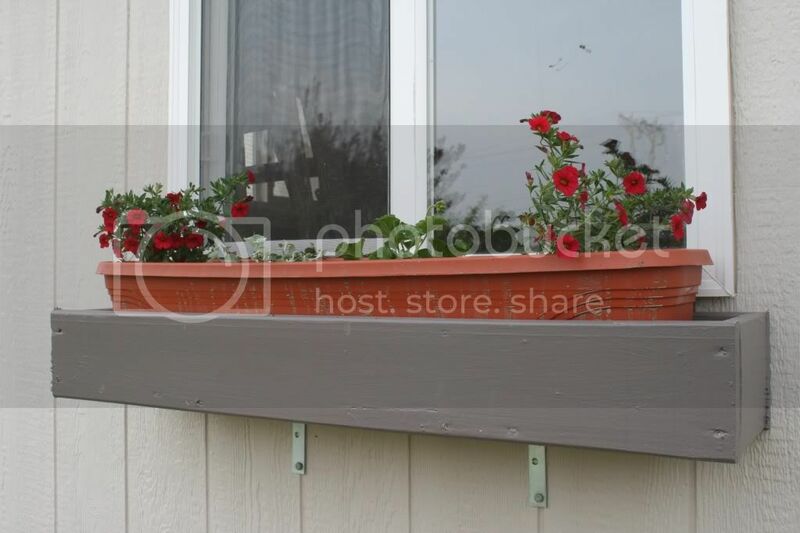 A container/patio gardener can only dream of having a real garden. I love the vegetable/flower containers. I can relate to that. Avonnow wrote: . . . Re: Beating the heat in Florida . . . I am not sure why anyone would not want to know that someone is harvesting garden vegetables, somewhere. I notice that Florida gardeners drop off the forums somewhat when the northern gardeners are struggling with difficult spring conditions. I'd like to hear about what the season might turn out to be for me and what it has turned out to be - for southern gardeners. Provides us with hopes and dreams there too! It must have rained a half inch here today and the Weather Service says that we might be looking at a half inch of snow in the morning. In the garden, I got snow, snap, and shell peas planted on Saturday but did both the garden and me a favor and stayed out of it today. Hopefully, I can move a little soil around on Wednesday. Here's something for you to think about, Avonnow : My garden soil drains really quickly. That's because, it is built on glacial till. Placed a tarp on my non raised bed area to prevent soil saturation due to a never ending supply of rain. "What'd you do lately for your garden?" Just watch it get snowed on. Hey Jal, I saw a forecast of snow that was set for higher elevations in Utah, I feel for you. 1. harvested lettuce, carrots, chard, and radishes. I had to replant more radishes because they go fast. 2. hand pollinated my squash because the pollinators haven't arrived yet. 3. removed my Romaine lettuce because it had bolted. I replanted more carrots in the lettuce space. 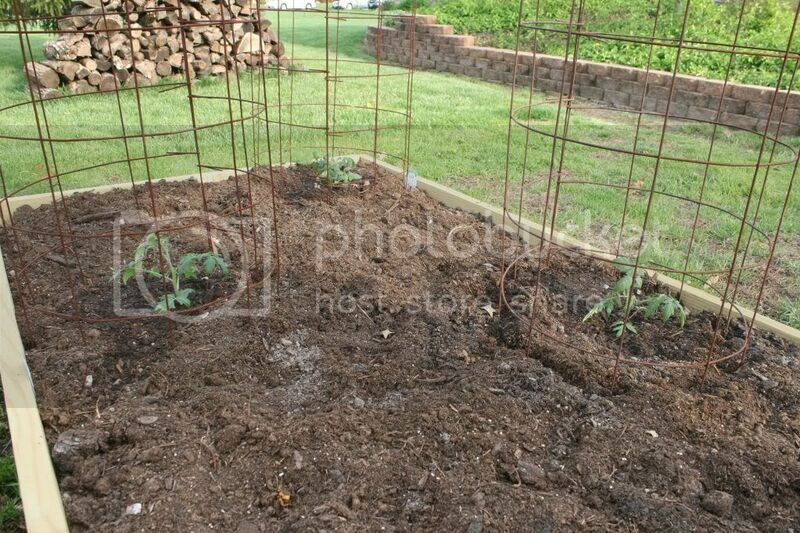 4. trimmed all the branches from the lower parts of my tomato plants to prevent soil contact and resulting disease. 5. started training my cucumber plants up the trellis. 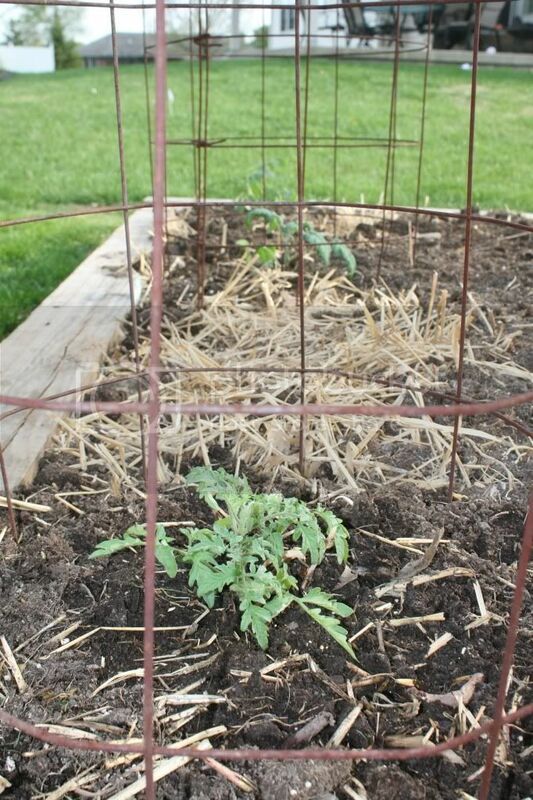 6. thinned some branches from the tomato plants in cages. It was simply to crowded in the cages. 7. carefully placed thinned and pulled vegetation in my compost bin to prevent damaging the new "muncher" (twenty cent pack) cucumber plants growing in the compost pile. I have a lot of large tomatoes hanging on the vines, but I have been watching my cucumbers because I usually can harvest cucumbers about one week before I can harvest ripe tomatoes. I do have some early tomatoes which should be ripe in a few days. Went home during lunch and uppotted my Zucchini plants into bigger pots, with nice, fresh (non fertilized) soil mixed in with compost. Waiting around for mid-may so I can finally plant them! Also checked on my onions and lettuces- with the temps in the 70s now, everything's sprouting like a mad man. 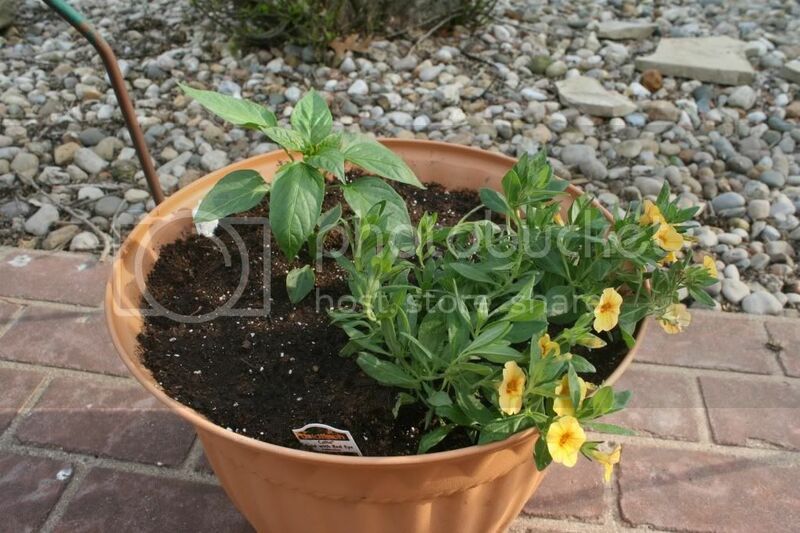 Also picked up some banana sweet peppers for planting, since I wanted to try an adventerous pepper plant this year!